The University of Miami, informally referred to as UM, U of M, or The U, is a medium-sized private research university located in the city of Coral Gables, just 7 miles from downtown Miami. 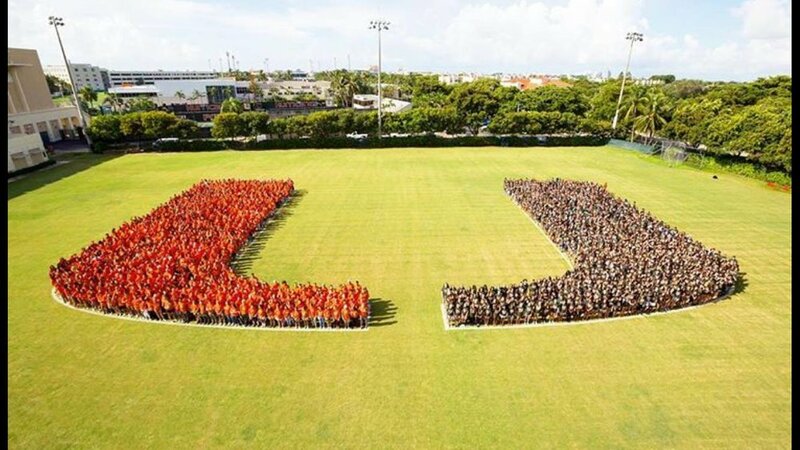 UM has a diverse student body made up of over 16,000 students from around the world. 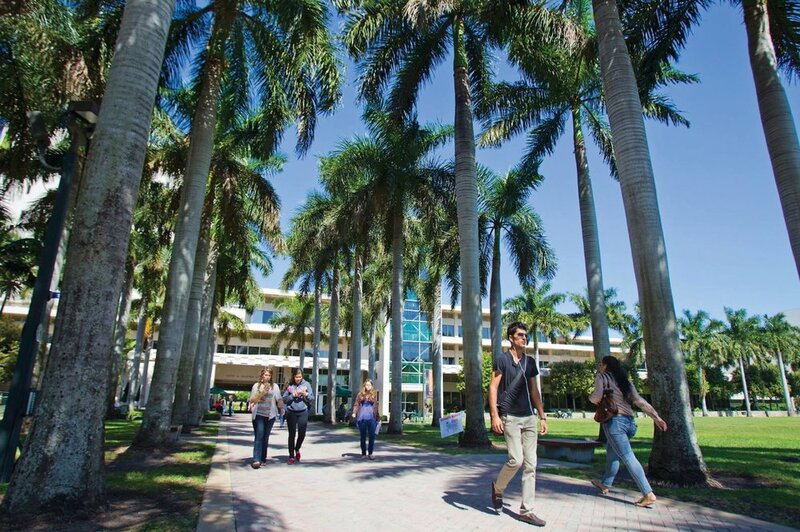 Students enjoy the best of both worlds: life on a beautiful 239-acre campus and the proximity of a cosmopolitan, multicultural city. Transportation: The nearest airport when visiting the university is Miami International Airport : Miami-Dade County,11 miles from the center of campus. Another major airport, Fort Lauderdale Hollywood International Airport is 34 miles from the school. Taxis, Ubers and Lyft’s are available at the airport. For bus and shuttle information from both airports click here. Amtrak has service into Miami Station, the southern terminus for the Silver Meteor and Silver Star trains. Stay: The most convenient place to stay is the Holiday Inn, which is located directly across the street from the UM campus entrance. The Biltmore is also nearby and a popular hotel, especially during parents weekend and graduation. There’s also the Westin Colonnade in Miracle Mile and the Ritz Carlton in Coconut Grove, two areas nearby with a wealth of shopping and restaurants. Downtown Miami is another option (only a 10-15 minute drive, depending on traffic) and has great hotels. Some of our favorites are The W Brickell, JW Marriott Brickell, The Mandarin Oriental and the EPIC. If you’re visiting during a long weekend, you could choose to make South Beach your base—visit our latest Daytripper365 South Beach itineraries here. Coffee: A few Starbuck locations are surrounding the UM campus, including a convenient drive-thru on South Dixie Highway. There is also a Starbucks located on campus in the Calder Library. Off-campus there are many places to get great coffee: two popular student favorites are Nordstrom E Bar Café, located at the shops of Merrick Park and Pasion del Cielo in Coral Gables. Breakfast: A popular breakfast/brunch spot is Greenstreet Café in Coconut Grove. One student states “You must go to Greenstreet. And when you go, you must order a bloody mary and the Nutella-filled French toast. It’s unreal. So are the pancakes.” Another popular spot is Threefold Cafe in Miracle Mile. One student told us, “This is my favorite breakfast go-to near campus. It’s quick and always so good. Order the smashed avocado with poached eggs and the cranberry lemonade --so good!” Another choice spot, close to campus, is Roasters’ n Toasters. Miami might not have bagel shops that rival New York, but Bagel Emporium and Coral Bagels have their fans and are also near campus. Lunch: Want to hang with the students, head to UM’s Rathskeller, redone and picturesque, situated lakeside right on campus. In Merrick Park, Yard House is an upscale sports bar with a large American menu. This is the place if you're craving a burger and a salad, and don’t skip the chocolate chip cookie skillet with vanilla ice cream! Havana Harry’s is popular at all times of the day for Cuban classics and fresh, local fish complimented by their excellent Mojitos. Casual: In Coral Gables head to The Local Craft Food and Drink for a southern inspired menu. Parents of a UM alum told us Whisk Gourmet is a hidden gem for seasonal, home-style fare. For traditional Indian fare, book a seat at Bombay Darbar, a neighborhood hotspot that’s always packed in Coconut Grove. The newest location of Bulla Gastrobar is where to head for Spanish tapas, paella, and sangria in Coral Gables. We hear the Huevos Bulla is a must order, a heady combination of eggs, homemade potato chips, Serrano ham, potato foam, and truffle oil. The Seven Dials is another local favorite, a British style gastropub run by an English chef and his American wife with a creative, modern menu. Yes, they have fish and chips and bangers and mash, but there are also dishes with an Asian and Indian bent as well. A Step Up: Miami is one of the hottest food cities in the U.S. with an endless array of restaurant choices. If you want to stay local, you don’t have to travel outside of Coral Gables for a great meal. For a real culinary treat reserve ahead at Ortanique--one of Miami’s most popular tables for creative Caribbean food. Hillstone is no ordinary chain, featured in Bon Appetit magazine as one of America’s favorite restaurants, known for excellent steaks, seafood, and pasta dishes. Small plates reign at Uvaggio, a European style wine bar and restaurant and at Eating House, located in a hip, funky space. Sweet Tooth: One student told us; “An afternoon frozen yogurt is always necessary in Miami, especially on a scorching hot, humid day. My Yogurt Bliss is a yummy self-serve yogurt spot across from campus with tons of toppings.” Students rave about Whip’n Dip, a family-run ice cream spot that has been around for decades. Local Attractions: On campus visit the Lowe Art Museum; see a performance at the Jerry Herman Ring Theater or a concert at the Gusman Concert Hall or Clarke Recital Hall. Browse the shops in the design district, walk along the ocean and admire the Art Deco buildings in South Beach, or explore the Vizcaya Museum and Gardens in Coconut Grove. Don’t miss a visit to the Wynwood Arts District where fantastic murals are spread across multiple blocks starting at the Wynwood Walls. For more detailed itineraries click here. Just toured the University of Miami Campus? Are you a UMiami student, parent or Alumni? Fill out this 2 minute survey to supplement our Daytripper University Guide for the University of Miami!